This issue offers an explanation of community building priniciples and how they can be applied working with youth. 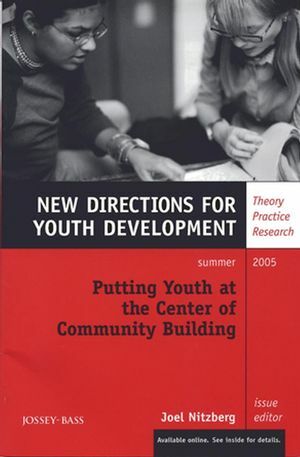 The authors provide examples of how community building can be connected to youth development and how youth can be change agents. The community building field emphasizes the importance of networking and building relations, enabling all members of a community to be change agents. Self-determination and change are not new to youth workers. What is new is expanding the work to enable youth to apply these skills to the greater community. This is the 106th volume of the Jossey-Bass quarterly report series New Directions for Youth Development. Click here to view the entire catalog of New Directions for Youth Development titles. Joel Nitzberg is a senior faculty member and director of the Division of Lieflong Learning of Cambridge College in Cambridge, MA. Youth development is an approach to help young people move toward maturity through sustained relationships and meaningful and empowering experiences. Community building offers a comprehensive approach to strengthening communities. Meshing these approaches creates powerful experiences that change both youth and the communities they live in. For over twenty years, people across the country have engaged in comprehensive initiatives to strengthen their communities. The lessons learned have focused on changes that extend beyond individuals and what occurs at the community level. Coproduction provides an approach to youth development that says: enable youth to use the skills they have to help others; honor that contribution with rewards; and use the process of helping others as an opportunity for youth to gain social and communications skills, self-knowledge, selfrespect, problem-solving competence, anger management, and conflict resolution abilities. Students, teachers, and staff are learning how to develop an educational philosophy and practice that is predicated on serving the community. Art therapy can be a community-linked treatment, integrating the knowledge of diagnostic categories and symptomotology with a therapeutic response grounded in theories of adolescent mental health treatment. The Center for Teen Empowerment inspires young people, and the adults who come in contact with them, to think deeply about the most difficult social problems in their schools and communities. Drumming can be used in a tangible way to focus on building community. The power of drumming includes enabling youth to express their individual voices while blending with a group. The Somerville Youth Council was developed by youth over a four-month period to create opportunities for youth in this Massachusetts city to identify the needs of their peers and formulate strategies to address these needs.